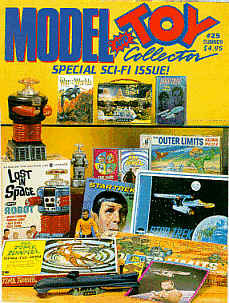 Originally printed in the summer 1993 issue of Model and Toy Collector #25. Edited for this magazine. Prices given, no longer honored. In fact due to actions taken by Paramount/ViaCom, there is no one known to be making any of these, only used ones trading from fan to fan. Star Trek prop replicas have been around since the mid 1970's and have utilized many different design interpretations and materials. 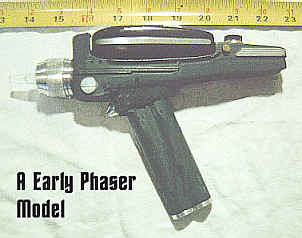 One of the earliest and most favored reproductions was the phaser. Early phaser bodies were constructed of either hollow fiberglass of vac-u-form plastic and metal. Detail pieces were made from lathed aluminum and acrylic rods. Many models featured a nice electronic strobe effect from the pistol emitter. This however, especially in the early models, required the Type I hand unit to be permanently mounted to the Type II pistol body due to circuit space requirements. These early reproductions tended to be very inaccurate, but with few close up pictures and no video tapes to freeze frame and examine at the time, their overall appearance was acceptable. The most noticeable inaccuracies included a battery meter on top of the hand unit and the use of a standard black equipment knob on the back of the pistol, As the phaser reproductions move into the 1980's, designs began to get more accurate. But, with increases in material costs as well as labor, more and more replicas began to appear in solid fiberglass and urethane resins with metal and acrylic details. Through the end of the 1980's. most designs were based on technical manual drawings which tended to be somewhat inaccurate and to the surprise of many fans, including myself, much too large. Over the past couple of years, reproductions have become much more accurate and true to the original props in both size and detail, Current prices for a pistol unit replica range from around $125 for a non-functional, solid cast piece, to around $225 for a top of the line light and sound Type I and II combination. Reproductions of other props, including communicators and tricorders, have been around since the late 1970's, with their construction being predominately of vac-u-form plastic with aluminum trim and lathed details, Shape and styling have stayed pretty consistent over the years with slightly more accurate detailing appearing on the more current models. Functional communicators often feature flashing LED's and 'chirp' sound when opened. Newer, more elaborate models contain a digital chip which plays back various messages like "Enterprise here, how many to beam up?" along with 'chirp' when activated. Functional tricorders usually incorporate flashing LED's with a scanning sound when the head is rotated open. Non-functional communicators are currently priced around $60, light and sound $125, and the talking ones, upwards of $200. Non-functional tricorders currently are available for about $130 while light and sound models go for about $180, As fans opted to increase their collections, medical equipment began to become available. Hypo reproductions are usually made of aluminum and come with 2 interchangeable glass vials containing colored liquid. Current models have a movable plunger which produces a 'hiss' sound when depressed. The hypo is one of the nicest reproductions available and usually sells for about $100. Current medical scanner replicas usually come with a rubberized body and aluminum end caps. The clear inner and outer scanning assemblies are usually made out of acrylic. Most are motorized and feature a spinning inner scanner at the press of a side button, Prices run around $60 for this motorized type, The spray healer and field reader tube reproductions are generally made from lathed aluminum. The spray healer has an inserted aluminum nozzle, and the reader tube 4 surface mounted, clear plastic squares, Both replicas are usually non-functional and are priced at $20 and $15 repectively. As the movies began to emerge in the 1980's. prop replicas began to follow. While not as sought after as their classic counterparts, they are still popular with many avid collectors, The most common replicas found are the 3 types of phasers. The first is flat shaped motion picture version, the more classic TV looking Star Trek III type, and the third, the large movie V assault phaser. Almost always these reproductions are of solid urethane with the latter type having a cast metal nozzle and rear heat sink. These non-functional replicas currently sell for about $100, $115, and $150 respectively. occasionally, functional versions of these replicas, along with movie communicator and tricorder replicas, can be found with prices ranging from $125 to $250 depending on the item. Star Trek: The Next Generation prop replicas are some of the newest reproductions available to the fan market. To date, most of these solid cast reproductions have been designed from technical manual information, and while having a nice look, do tend to be a bit inaccurate, Currently the type I unit sells for around $50. The type II "dustbuster" and 'snakehead" types go for $135 and tricorders for $145. Many of the above mentioned prop replicas are available from various sources in kit form, but their quality in sometime questionable, Most prop replica makers refuse to sell their reproductions in kit form, so be aware that when you are purchasing a prop replica kit the following is most likely true: the kit is probably from a finished replica which was disassembled and cast, It may have varying degrees of imperfections, from air bubbles to flawed or warped surface detail depending on the caster and cast generation, It might be altered from the original replica with detail added or removed. Finally, any part originally in metal will likely be cast in plastic, either separately or as part of the main body, If you're willing to sand, fill and paint, some of these kits can turn out nicely. It all depends on the skill of the modeler and whether the finishing time is worth the money you will save over a completed replica.